Kofi Annan, the first black African to serve as the Secretary-General for the United Nations, passed away early on Saturday. He died at a hospital in Bern, Switzerland where he was being treated for a short, unspecified illness. He was 80-years-old. Annan was born in Ghana in 1938. He studied at an elite Methodist boarding school in Cape Coast called Mfantsipim from 1954 to 1957. It is there, he said, that he learned "that suffering anywhere concerns people everywhere." He began working for the World Health Organization in 1962 and then for the UN High Commission for Refugees (UNHCR) starting in 1980. He was appointed as an Assistant Secretary-General of the UN from 1987 to 1996. He served as the UN chief from 1997 to 2006. In 2001, Anna was awarded the Nobel Peace Prize. He was the second UN Secretary-General to be given this prize. In 2007, he became a member of The Elders, a humanitarian group of just a dozen leaders formed by Nelson Mandela. That year, he also set up the Kofi Annan Foundation to promote global sustainable development, security, and peace. 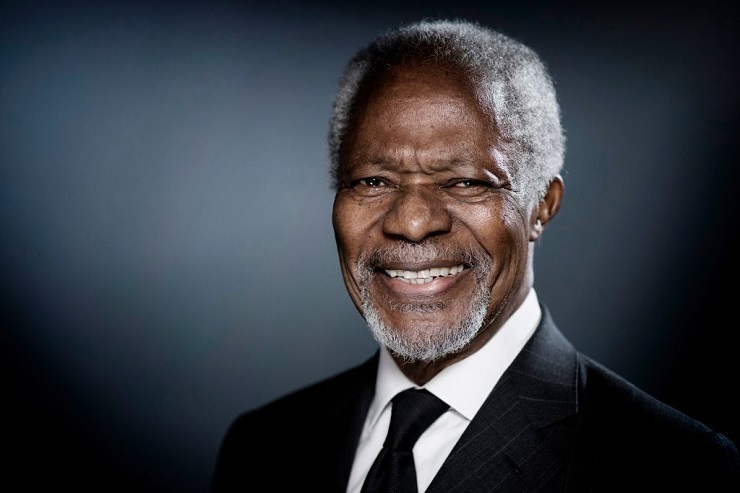 Despite his successes, Annan was not without regrets, saying in 2004, "the international community failed Rwanda and that must leave us always with a sense of bitter regret. I believed at that time that I was doing my best. But I realized after the genocide that there was more that I could and should have done to sound the alarm and rally support." Tributes have been pouring in from around the world since news of Annan's death has spread. US Ambassador to the UN Nikki Haley shared that Anna "worked tirelessly to unite us and never stopped fighting for the dignity of every person." Israeli Prime Minister Benjamin Netanyahu said, "We will remember him as having been very active in the international arena and as someone who fought anti-Semitism and Holocaust denial." Despite their differences (Annan called the US invasion of Iraq "illegal"), former president George W. Bush praised Annan, saying that his "voice of experience will be missed around the world." Former president Barack Obama said of him, "His integrity, persistence, optimism, and sense of our common humanity always informed his outreach to the community of nations." Annan had been living near Geneva for the past several years. His wife Nane and their three children were by his side during the final days of his life.